The palm-fringed backwaters are one of the top places to visit in Kerala. You can take a traditional Kerala-style houseboat along the backwaters, stay at a hotel along the backwaters -- or both! There are many hotels and resorts that front massive Vembanad Lake, in the heart of the backwaters. Most of them are located in and around Kumarakom, in the Kottayam district of Kerala. They commonly have their own houseboats and offer sunset cruises or overnight trips, and those that don't can easily organize them. To get some ideas about the various options available, check out these 10 Kumarakom hotels and resorts to suit all budgets. They are roughly ordered from most expensive to least. The best resort along the Kerala backwaters and one of the best heritage resorts in India, the magnificent Kumarakom Lake Resort has a string of awards to its name. Located on 25 acres of lush land around 30 minutes from Kottayam railway station, its 59 luxurious traditionally-styled rooms and villas have been reconstructed from the 16th-century homesteads of Kerala. Facilities include an Ayurvedic spa, multiple swimming pools, two restaurants, and tea shop. Village walks, sunset cruises, cycling, water sports, and other activities are also offered. It's worth paying extra for a villa with its own private pool. The intimate Vivanta by Taj is perfect for romance. Located not far from the Kumarakom Lake Resort and next to the Kumarakom Bird Sanctuary, the hotel is housed in a restored 19th-century colonial bungalow that was built by an English missionary. 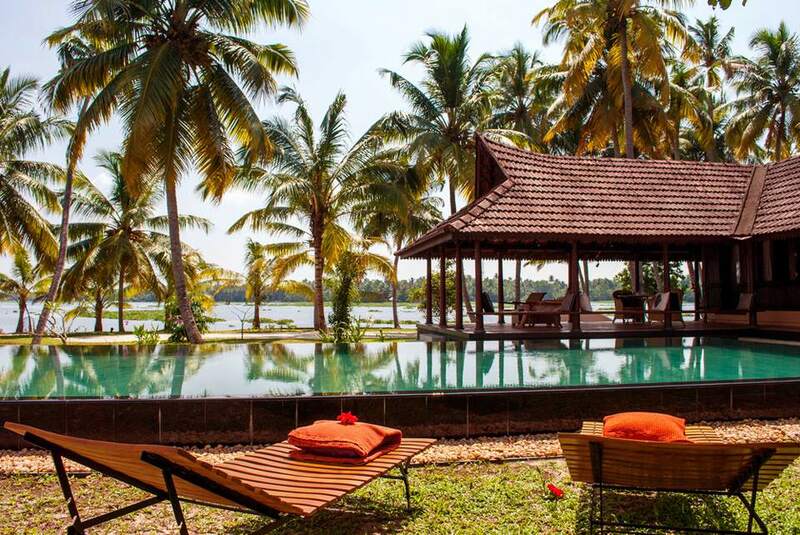 Situated on a coconut plantation at the mouth of the Kavanar River, just off Vembanad Lake opposite the Kumarakom Bird Sanctuary, the spectacular Coconut Lagoon is an eco-friendly resort that's owned by the renowned CGH Earth group. The only way to reach it is by boat, making it very private. It's a sizable property with 52 heritage bungalows, mansions, and pool villas on 30 acres of land. Around eight of these acres are used for rice cultivation. Many of the resort's traditional buildings, which have been transported and restored, are made out of wood up to 200 years old. The resort aims to give guests an authentic Kerala experience, complete with Kerala martial arts demonstration. There's a butterfly garden as well. The Zuri is one of the largest and most established resorts on Vembanad Lake. Opened in 2006, it was revamped a few years ago and remains very popular. It's located in the same areas as the Vembanad Lake Resort and Taj Vivanta. The Zuri has 72 rooms, cottages, and villas spread over 18 acres of landscaped grounds. If you want to be pampered, you'll love the fact that it has one of the best spas in India (which is also the biggest spa in south India) as well. The resort is also one of the leading places to have a destination wedding in India. Also located on the banks of Vembanad Lake just down the road from The Zuri, Karma Grove is a relatively new boutique resort (opened in 2013) with 24 rooms. This architecturally designed property is partially built around and over the water, and each room has a spacious outdoor balcony with sweeping views of the lake. Facilities include a 21-meter infinity pool and Ayurvedic massage. Vismaya, meaning magical place, is a gorgeously restored luxury heritage villa on the banks of Vembanad Lake. The villa is believed to be more than 400 years old and it once belonged to one of the village chieftains. It has only two bedrooms and a private swimming pool, set on extensive grounds. Treat yourselves! You'll adore it and won't want to leave. Rates vary greatly depending on the time of year and are least expensive during the monsoon season. You'll pay less for one bedroom and roughly double to book the whole villa. Waterscapes KTDC Backwater Resort is a government run property, and it's a surprisingly good one! It's in the same area as the resorts mentioned above but is actually situated inside the Kumarakom Bird Sanctuary. Notably, the property is part of the original Kavanattinkara estate that belonged to Alfred George Baker -- an English farmer who laid the foundations of Kumarakom by reclaiming 500 acres of wetlands in the 1840s. A feature of the resort is its 40 unconventional cottages on stilts, overlooking canals and the lake. If you're traveling on a budget but still want resort facilities, this is the place to stay! This inexpensive gem has just six guest rooms in a traditional Kerala house. Remotely located on the Meenachil river (which flows into Vembanad Lake), around 15 minutes from Kottayam town, it's an excellent place for couples who are looking for a tranquil getaway, off the beaten track. The house has a verdant garden and peaceful outlook onto the river and provides a simple village-style Kerala backwaters experience. Attractive package deals, including a night on a houseboat, are offered. The family-run Vembanad Lake Villas is another recommended budget option in serene surroundings away from it all. There are five cottages on the property, set amongst six acres of land near Vaikom village on the outskirts of north Kumarakom. It has canals running through it, and a huge variety of plants and birds. The cottages have verandahs that either face the lake, or canals and paddy fields. A highlight is the authentic Kerala cuisine that's cooked fresh by the hosts and is absolutely delicious. Children will enjoy the paddle boats. It's a super value for money and perfect for relaxation.